Following on from the Gala Fundraiser where in excess of $102,000 was raised on the night, the Rotary Club of Tamar Sunrise has worked with Motors and Nissan to secure a Micra ST to auction. The Auction opens on 29 January 2013. Anybody who would like to bid for the car from 29th January 2013 will find a link below. 1. Information on how to participate in this fundraising auction and the car form part of these Terms and Conditions. Entry and participation in this auction is deemed acceptance of these Terms and Conditions. 2. The Promoter referred to in these Terms and Conditions is the Rotary Club of Tamar Sunrise. 3. Thanks to the generosity of Motors, we have one Nissan Micra, for online auction – as specified (colour and specifications are non-exchangeable). 4. The Tasmanian Rotary Bushfire Appeal will receive the total amount, less the cost price of the vehicle (not the full amount). 5. To make a successful bid, participants must be over 18 years of age. 6. A valid bid is an online message (Launceston Responds) with a valid Australian currency amount, higher than that of the reserve ($12,500) and higher than the previous valid bid. All bids must be in full dollars. The successful bidder must be able to collect the vehicle from Launceston. 7. Bids are subject to approval and the highest nor any other bid may not be accepted. 8. The online auction may be cancelled at any time. 9. 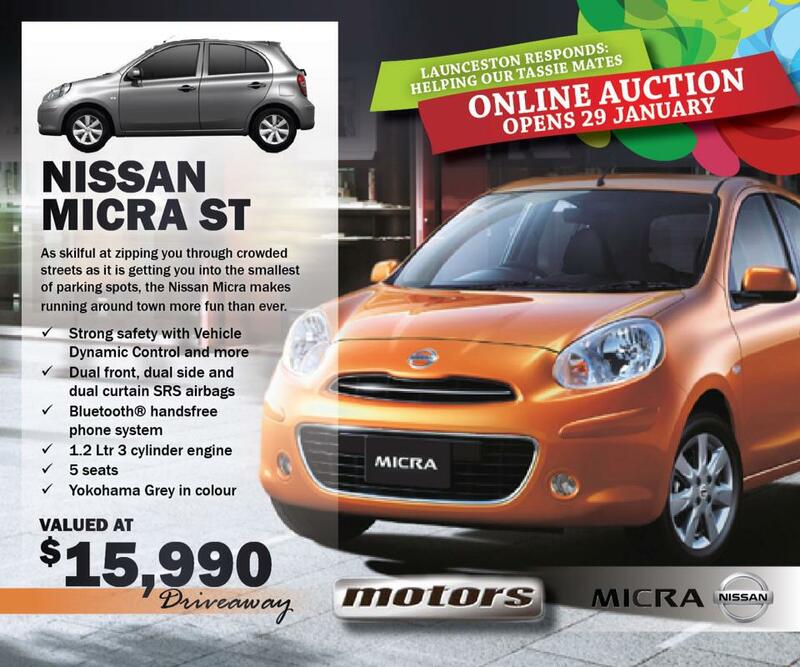 The online auction closes at 6.00pm (Launceston time) on Sunday, 17 February 2013. 10. The highest valid bidder will be contacted and provided with seven days to pay in full and collect the vehicle. 11. The promoter will not be held accountable for any expenses associated with the online auction incurred by participants. 12. The promoter accepts no responsibility for technical problems encountered during participation in the online auction. 13. Facebook is not connected with this online auction in any way. 14. Test-drives are welcome at Motors Launceston.